The most stable lever action reload fix out there with working 3rd person. -The most stable lever action reload fix out there. -Adjusted time values with all object mod which modify reload speed of the lever action rifle (such as tuned receiver or rapid fire legendary effect). -Fixed issue when player inserted needed number of bullets in shell even though he hadn't had enough ammo in inventory. From this update source scripts won't be uploaded here. You will be able to download them from Bullet Counted Reload Tutorial page. -Fixes bug when player wasn't able to shoot continuously while holding shoot button. 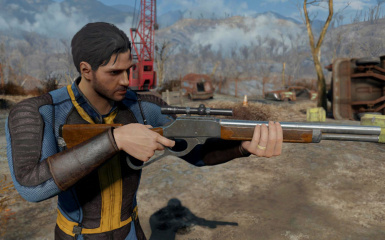 This mod fixes the infamous reload bug when using Lever Action Rifle. Player always loaded 5 bullets no matter how many times you have shot. There already is the other mod which fixes that bug, but this one uses completely different approach, has almost no bugs + works in 3rd person. Please make a clean save before updating. Use NMM or drag and drop files into fallout 4 directory. As vanilla reload animation is maximum 5 bullet insert, it isn't possible for script to work with mods which increase magazine size of lever action rifle. Creating new animations are required for that. For now the fix doesn't work correctly if you are in power armor, working to add this. Also script stops working for a while (only once, for current reload) if you continously jump while reloading (I don't know why you should jump when reloading a gun). This happens only in 1st person. Jump as many times as you want in 3rd person. I'm working to fix this. Ha_ru (blackxteel on Nexus) for providing edited animation files. colinswrath for support and giving useful opinions.